As with most things, reading the instructions is a great place to start when learning how to use something that you are not familiar with. 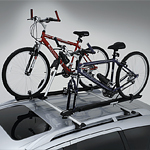 Roof racks will come with installation instructions and tips and tricks for how to use them properly. Make sure to read them. Be careful when installing the rack and avoid over- or under-tightening the bolts that hold it on your car. If it is attached properly, then everything will be fine. However, if the rack is loose or too tight, you run the risk of damaging the frame of your car. If you find that your car is in need of servicing for whatever reason, then feel free to come on down to our dealership, which is conveniently located in Toronto, and our experienced technicians will be glad to remedy the situation.